Brian Chan and I are excited to announce the release of our long-awaited Stillwater Fly Fishing App. Together, we have combined our 75years of experience fly fishing for trout and char in lakes to develop this valuable educational tool. We believe this App will become an essential tool in the toolbox for anglers of all skill levels. Hello, my name is Phil Rowley. Welcome to my website. Browsing through these pages you will find tips regarding strategies and tactics, fly tying, entomology, upcoming events and many other points of interest. Please visit my online store for unique products and flies. If you are interested in expanding your fly-fishing knowledge, particularly stillwaters, consider booking a day of instructional guiding. Perhaps your local club or organization would be interested in an evening or weekend seminar. My goal is to teach and pass along my experience and knowledge to you. For those interested in further education on this fascinating sport, I encourage you to become a member of Fly Craft Angling. As members, you will be eligible for, video tying clips, enhanced video how to's, equipment reviews, guest writers and other value-added features as my site grows. 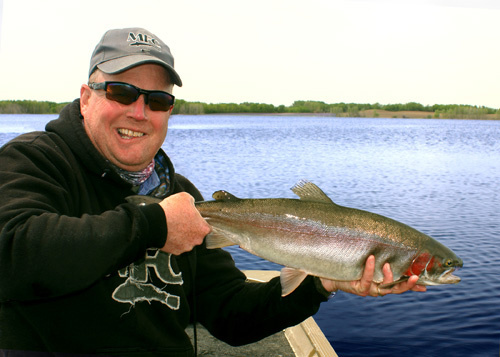 Although primarily devoted to stillwater fly fishing we shall explore other avenues of fly fishing and tying including salt water, rivers and streams. Any body of water that holds fish is fair game. Whats New - Great News to Share! Me and Brian Chan's Stillwater Fly Fishing App is now available for download on both iPhone and Android devices.